Advanced training. Mentoring. Leadership opportunities. Career development. These are the key ingredients in any successful fellowship program, and they are the hallmarks of our programs as well. For us the opportunity is clear. 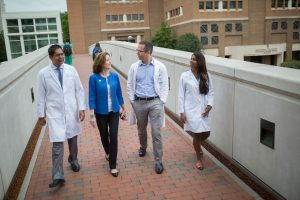 Fellows must be provided with the most advanced and dynamic learning environment available today so they can be effective and well-rounded medical professionals when they face the challenges of tomorrow. Contact us if you would like to learn more about the programs we offer. We look forward to discussing the rich opportunities and exciting challenges that can help you successfully pursue your academic and professional goals. UNC is more than just a great place to learn. It’s also located in a particularly great place to live; Chapel Hill, NC. Located nearby are Raleigh, and Durham, NC, as well as the internationally renowned Research Triangle Park. Chapel Hill and neighboring locales offer a quality of life that is matched in few other locations. Whether your recreational interests are related to following top-ranked sports teams, five-star dining options, a world-class performing arts center, or beautiful landscapes, UNC is located in of one of the best places in America to call home. #1 among the “10 Best Small Cities for Education in America” by Movoto.com. #7 nationally among “Top 10 Most Vibrant Communities” by the National Center for Arts Research. #5 among best public universities in U.S. News & World Report’s 2014 “Best Colleges” guidebook. Listed 1st among public campuses for the 11th consecutive year. #27 among the world’s top 500 research universities and 9th among U.S. public campuses, according to the 2015 U.S. News and World Report Best Global Universities rankings. Learn more about why our region has been ranked one of the best places in the US to live, work and play.